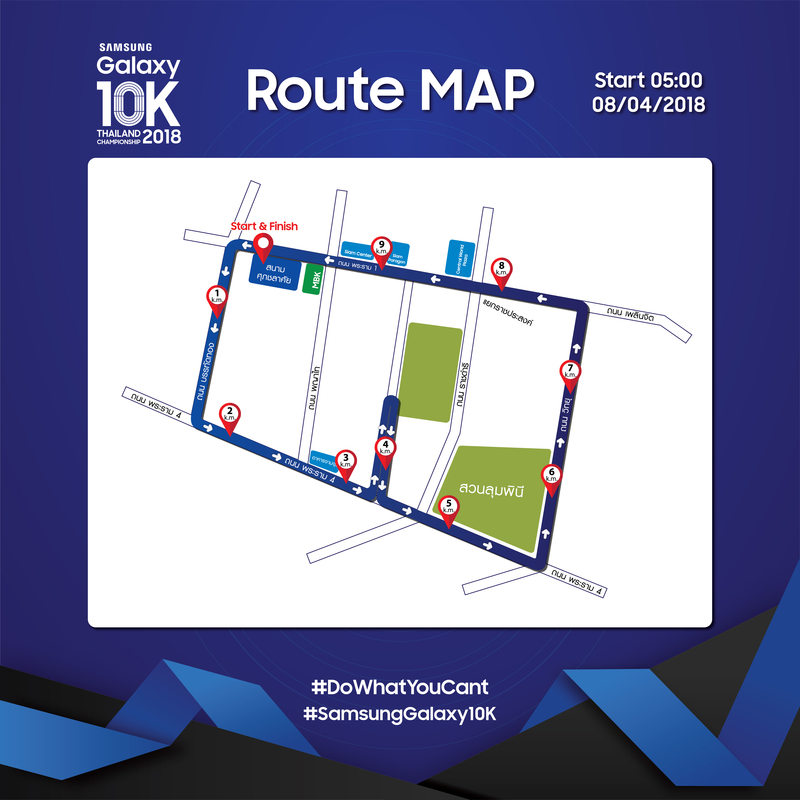 The biggest 10K road race in Thailand to find the top of 10 km runners on Sunday, April 8, 2018 at Supachalasai National Stadium in Bangkok, Thailand with the standard of competition manual in “The standard of running events in Thailand” and certificated by Athletic Association of Thailand under the Royal Patronage. 4. All nationalities are welcome to register. 1. The event will comply with all domestic laws and regulations. 2. The race rules, race regulations and entry regulations are also embraced. b. Loss or damages of personal property. c.	Uncontrollable delays of the race. 4. To ensure the security of the event, the organizer will set up the management along with suitable regulations over the race area. 5. Runners are required to reach the race venue at least one hour before to the start. The gate closes 15 minutes prior to start time. 6. Runners are required to follow the instructions of the organizer and referees strictly, otherwise they might be disqualified from the race. 7. Runners must check and pay attention to announcements from the organizer both before and during the race. 8. Photos, video/voices records, articles, and race statistics are all reserved under the right of the organizer. They are possibly publicized and broadcasted to media such as newspapers, the internet, TVs, magazines, ect. Runners can make use of their photos, video/voices records without permission. However, all photos and video/voices records of the event as well as the race are absolutely prohibited for commercial exploitation. 9. The organizer gives precedence to the privacy and the security of candidates’ personal information, and will manage it carefully. 1. Runners must arrive at the start line before the time, according to their registered distance. 2. Runners must enter the release block following expected time groups identified when registering. The block code will be shown on bib number. If runners do not follow this instruction, it shall be considered as violating the rules. 3. Runners must start running according to their registered start time. Starting after 15 minutes shall be considered violating the rules, and participants shall be disqualified from the race. 4. Bib numbers must be adhered to runners’ chests so that they can be seen clearly. Runners without bib numbers presented are not allowed. 5. Runners must run along the race course (following the arrows, ribbons, and signs/direction symbols). Do not use shortcuts. 6. Time limit for 10 Kilometer run is 2 hours, with cut-off time at km.4 is 6:18 am. and at km. 7 is 6:54 am. Runners who reach this cut-off point after this announced time should transport to the finish line by sweep vehicle in order to return traffic to normal. 7. Runners are not allowed to have followers or assistance on course. 8. Do not dress or carry any devices that can harm other runners. 9. Do not dress inappropriately as it might cause uncomfortable feelings to other runners or spectators. Impolite or obscene outfits; showing political attitudes; disparaging religions or beliefs; advertising products; or disseminating propagandas, for instance. 10. Do not use equipment/devices or sounds that make others misunderstood that they starting signal. 11. Do not perform any actions that bring about delays of the race or obstruct runners to reach the finish line. 12. Stop or give a way to emergency vehicles or staff. 13. Follow instructions of referee and marshal strictly. 14. The judgment of the race is grounded on Gun Time System (Time from the center clock of the race) following the rank signs distributed by referee. Electronic chips are used for timing and examining passing of check points. 15. Winners must present their ID cards, any official cards issued by government agencies with id numbers and photos, or passports in order to obtain awards within 30 minutes after official announcement; otherwise, they shall be disqualified from the receipt of awards. 16. Runners entitled for award must have their name on the formal registered runners list. 17. For winners or potential winners wishing to appeal the results, appeals must be submitted in writing to the Result Referee, accompanied by a deposit of Baht 3,000 within 30 minutes after the official announcement of the results. The deposit will be forfeited if the appeal is not successful or is withdrawn. The Organizer reserves the right not to entertain any dispute or appeal submitted thereafter. 18. Other unidentified rules shall refer to those regulated by A.A.T. 19. The judge’s opinion is considered final. 1. Each candidate can register only one application. The use of others’ names and personal information on behalf of candidates themselves is also prohibited. 2. Any false information or document forgery for the registration is absolutely prohibited. 4. Candidates are not allowed to edit/revise registration information after confirmation. Therefore, please check the information thoroughly. 5. Some types of computers, laptops, tablets, mobile phones, and their operating systems might cause errors to candidates’ registration. The organizer is unable to be responsible for functions of all devices and shall not be accountable for any delays arisen from internet connections that may occur . 6. If numbers of candidates are more than the announced quota, e-sampling results shall be notified via email on 9th September 2016. 7. The organizer will not take responsibilities for incorrect emails and non-receipt of email concerning e-sampling results. It is the duty of candidates to check their inboxes or the website. 8. As there are a large number of candidates, the organizer is unable to answer individuals about the status or results of the registration. 9. Selected candidates from e-sampling must settle the payment of the registration within the deadline (15th September 2016), otherwise they shall be deemed as waiving the right to join the race. 10. Candidates who grant their right to others as their representatives will be disqualified from the registration next year. And candidates who use running numbers of others do not have the right to get awards. 11. To authorize others to pick-up race kit on behalf of candidates themselves, ID card copies/passport copies of subjected candidates must be presented. ID Numbers or Passport Numbers in those official documents must match the registered ones. 12. No race kit pick up on race day. 13. The organizer reserves the right not to refund registration fees in case of cancellation or adjornment of the race due to uncontrollable factors or disasters. Winners are eligible to receive overall or age group trophy only once. Withholding tax will be applied to all cash award. 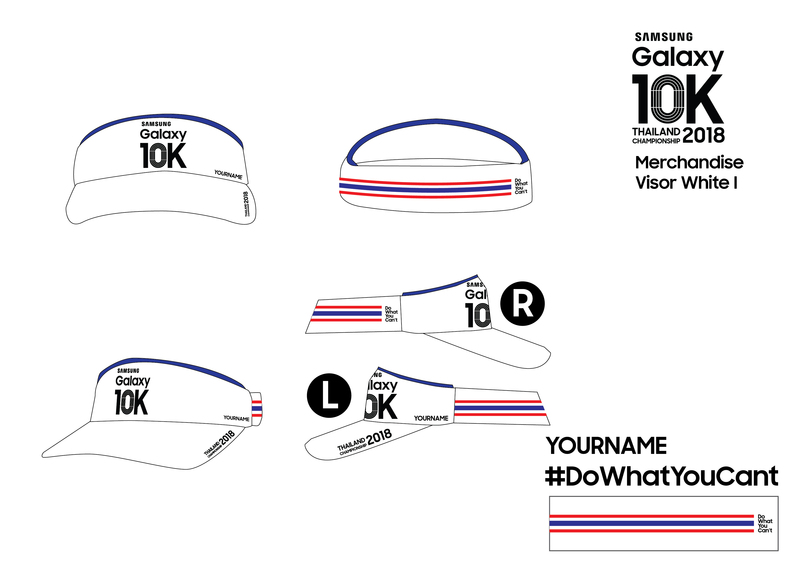 First 100 Thai nationality winners (Top100) both male and female are entitled to receive visor with their place embroidered. 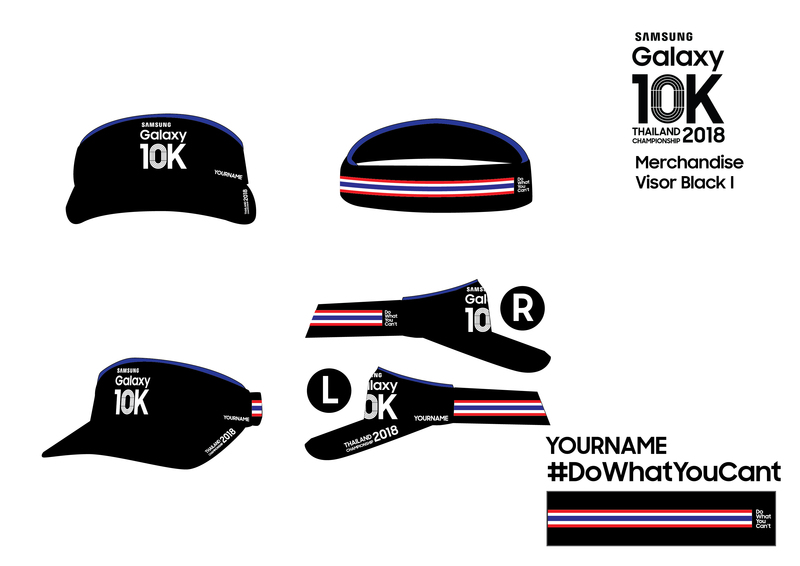 10K visor has designed for protect your eyes from the sunlight, increase visibility, ventilation and light weight. Materials production are the same with cap product in the global competition that can be used in the game, daily life and training. The shape of cap has designed by mixing the lifestyle between Hip-hop and Athletic lifestyle make it trendy and fashionable. Thanks for all runners who interested to joining a lot. 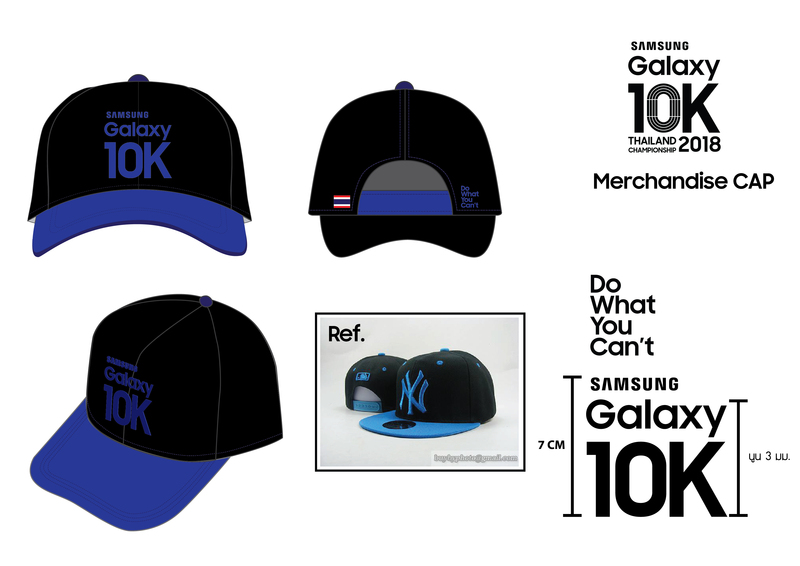 There are now full applicants, Samsung Galaxy 10K Thailand Championship 2018 is here to be officially closed.